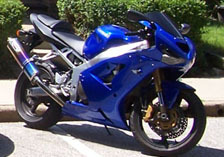 Description STOLEN: AUGUST 4TH, 2008 Bike is all blue with the exception of the black tail. Windshield was painted black. Exhaust is a Scorpion blue titanium flame. There are no ZX6R stickers on it, just a Kawasaki sticker on the gas tank.